Heads Up! – Watch a Monster Asteroid Miss Us! On Monday, January 26 North American stargazers have a ringside seat for the near miss of a monster asteroid. On Monday night an asteroid known as 2004 BL86 will pass just 1.2 million kilometres from Earth, a close approach that brings it to within three times the distance to the Moon. Many small asteroids have made the news of late that have approached much closer than this. The difference with 2004 BL86 is that this hurtling interplanetary rock is 1/2 kilometre across. That’s big for a near-Earth asteroid. If one this size were to hit Earth it would create a city- or region-devastating catastrophe of epic proportions. No bigger asteroid is known to be coming this close to us until the year 2027 when 1999 AN10 comes as close as the Moon. On Monday night 2004 BL86 will be moving so fast (about 2 degrees an hour) that, through a telescope, you should be able to see it move in real time, appearing as a dim star gliding against the background stars. 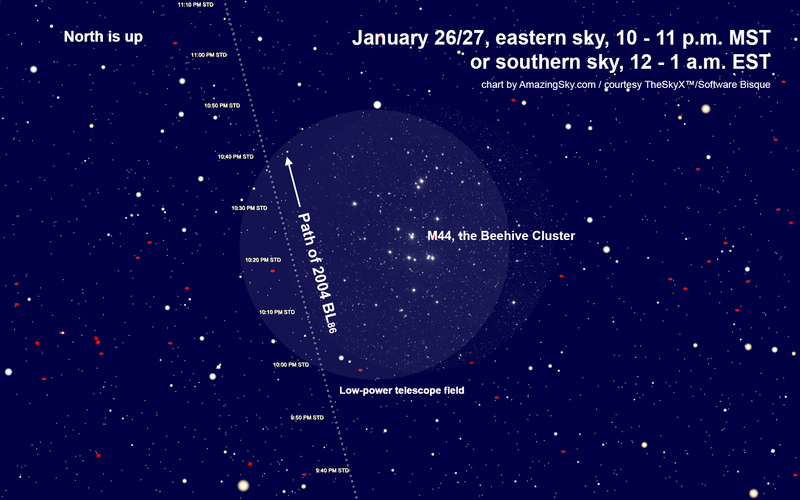 The best time to watch will be between 10 and 11 p.m. Mountain Time (or midnight to 1 a.m. Eastern) when the asteroid will be buzzing past the Beehive star cluster, aka Messier 44. It will be high in the east and any star chart, planetarium software or GoTo telescope will show you where to find the Beehive cluster in Cancer. From a dark site, the Beehive appears as a fuzzy glow in Cancer between Gemini and Leo. Locate the Beehive in a low-power, wide-field eyepiece. The asteroid will be moving up (north) past the cluster on the east side of the cluster. The diagram provides a normal view matching the naked-eye orientation of the sky, with north up and east to the left. In a Newtonian telescope the field will appear upside down – the asteroid will appear to the right of the cluster moving down. In a refractor or Cassegrain telescope with a star diagonal the field will appear mirror-reversed, with the asteroid again on the right side of the cluster, but moving up. 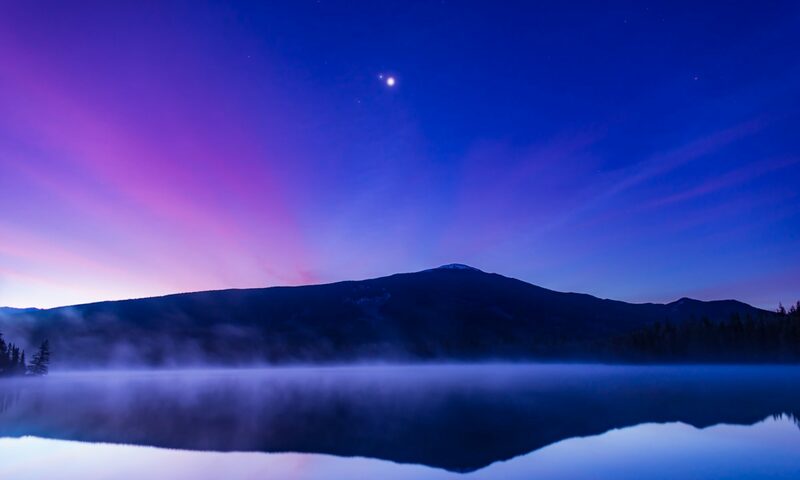 The asteroid will appear at ninth magnitude, the brightness of some of the moderate brightness stars plotted. Using any telescope 80mm or larger in aperture, picking out a ninth mag star should be easy, even in city skies and with the waxing Moon up, as long as you have clear skies. Just be sure to use your lowest power. Happy asteroid hunting! Just remember to duck! For more info and finder charts, see Sky and Telescope’s page. I wonder how people like the Romans and the Greeks ever made it without their daily asteroid reports.